Happy April, friends! I hope you all had a lovely weekend... and if you celebrate Easter, I hope it was a happy one filled with family and celebration. Holidays are exponentially more fun for me these days. Now that we have Marin, we get to experience the joy and excitement that you feel as a child all over again, but through her. 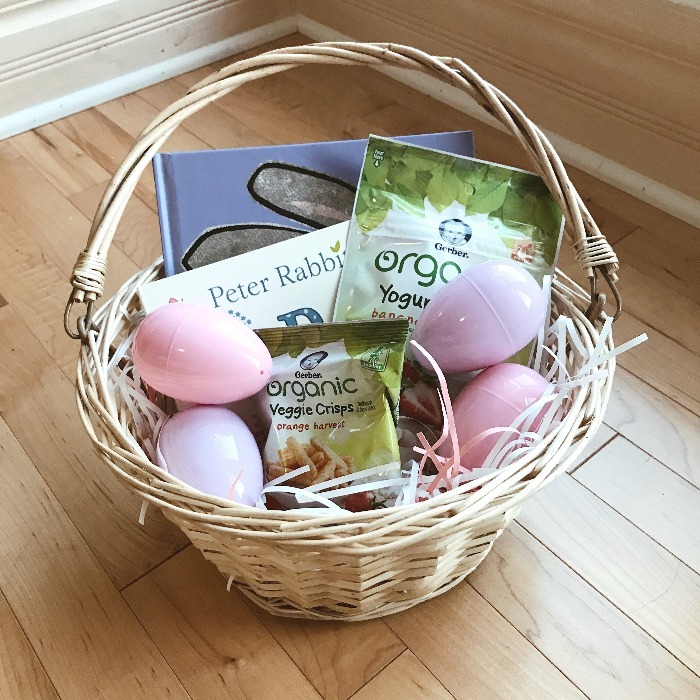 I knew I wanted to put together a little Easter basket for her, but didn't want to go too overboard since - let's face it - she's 10 months old and can't hunt for eggs, eat candy...or all of the typical activities involved with the holiday. But, I was still able to find a few little things that she really loved, and I thought I would share it on here for any mamas that might need a couple ideas for next year! I started out with a relatively generic basket. It was under $10, and I wanted something that would last a few years, that I could dress up differently. I picked this one from Target (minus the cloth liner) and filled it with some white and pink grass. 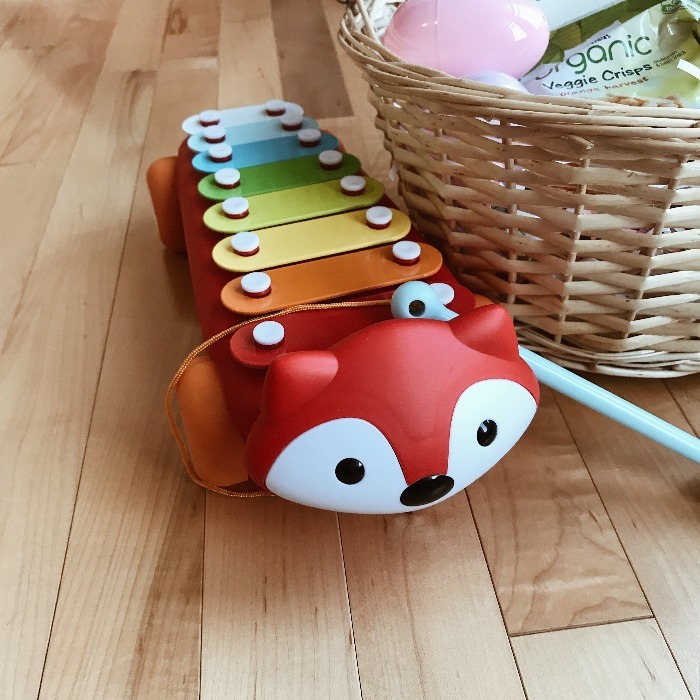 I felt like Marin is at the age where she would enjoy something that made music and is interactive, so I grabbed this adorable Skip Hop xylophone. She just loves playing with it - she will bang around on the chimes with the mallet, and also drag the whole thing around with her like it's a pet on a leash! 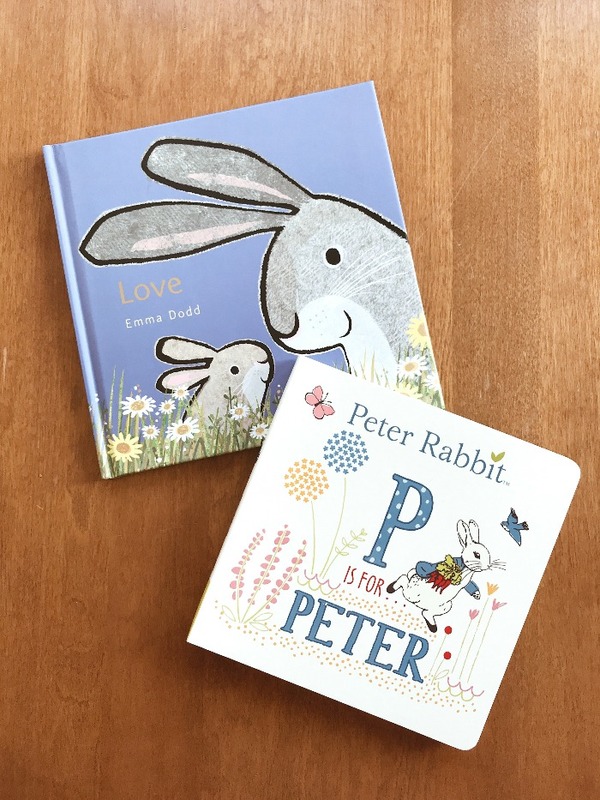 I also knew I wanted to add some books, especially when I saw what cute stories they had for sale in the Easter section. I picked out this one because the message is so beautiful (with pages such as, "Love is in the morning when you wake and smile at me") and this one because it teaches the alphabet, but also has the most gorgeous illustrations. The other items I added to the basket included some of Marin's favorite snacks. I grabbed a bag of yogurt melties (as we call them - not sure why lol)...and veggie crisps. I also wanted to have some classic Easter eggs in there, so I filled a couple of them with the yogurt melts and baby puffs. She just loved shaking them, and then discovering there were treats inside! Aaron and I head to church for Easter service after spending some time playing with her, and she got to stay home and hang out with her Lovie (my sister, Allison). Allison was in Columbus for the weekend and always makes time to spend with Marin, which makes my heart so happy - it is amazing seeing your little sister and your daughter love each other! Aww you did a great job with her basked - lots of fun little gifts! Perfect little basket! I love the holiday themed books! Can't go wrong with those! 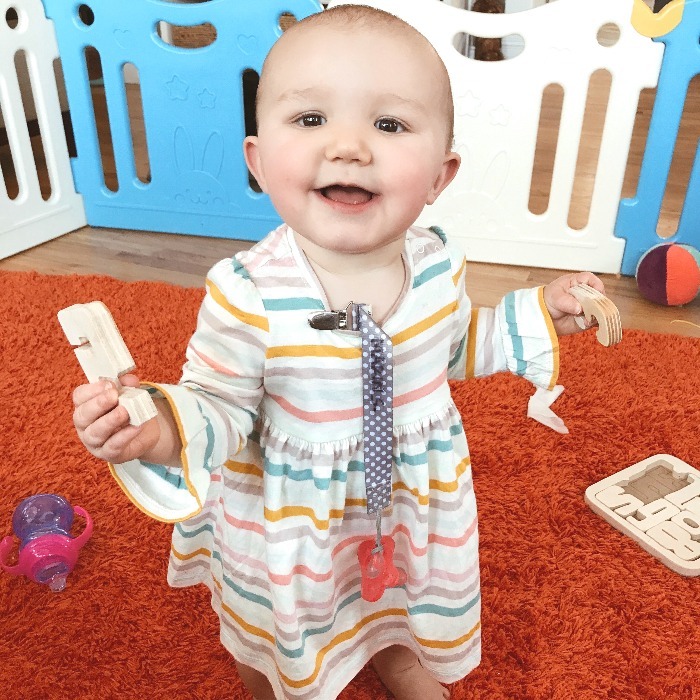 Love her little dress!